• Switch between a symbol or text Speech Builder. • Compose speech using text-to-speech, images, audio, & video. 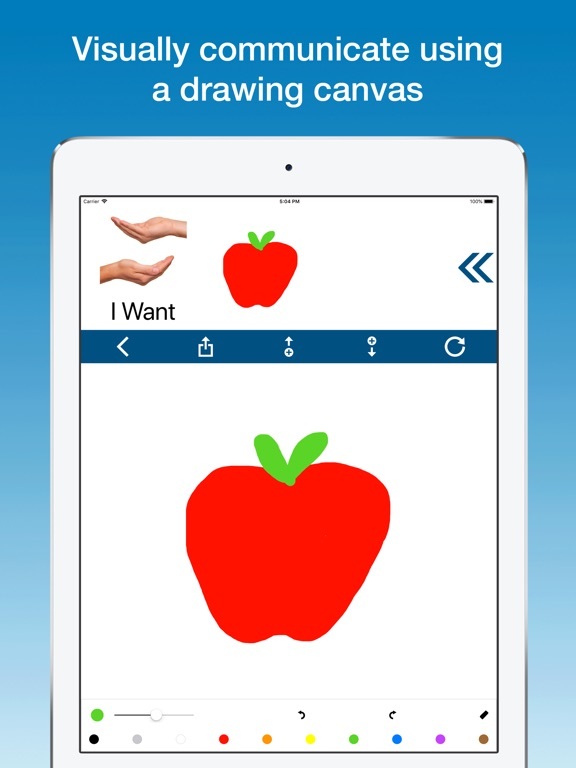 • Visually communicate using a drawing canvas. 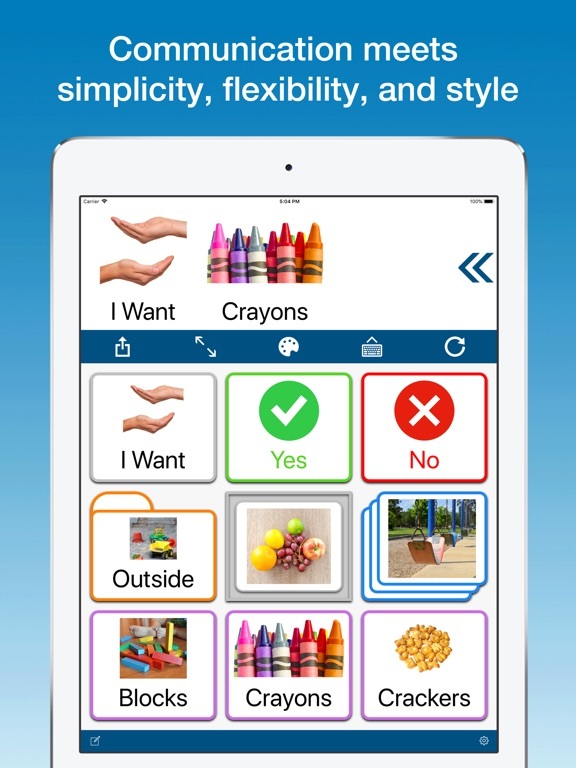 • Organize your items into folders, sequences, & interactive visual scenes. • Use real-time search when typing for quick access & navigation. • Select universal items to show in every folder for quick access. 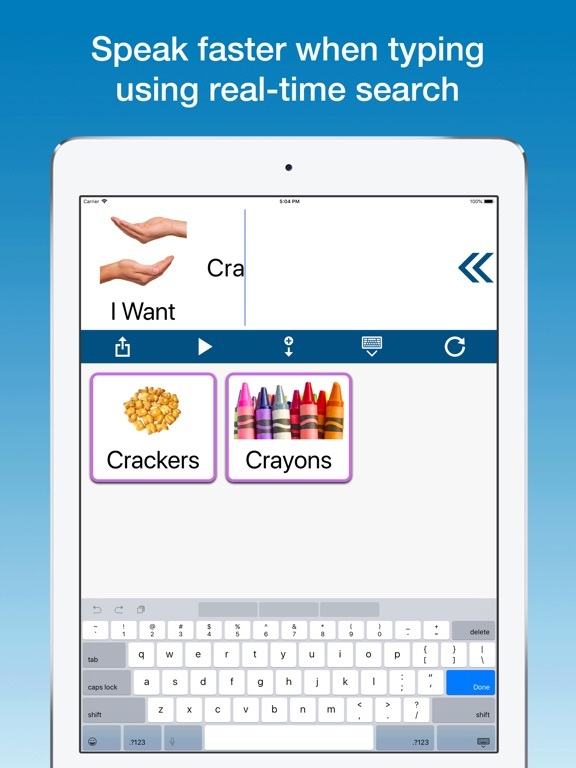 • Display & speak items as letters to compose novel speech. 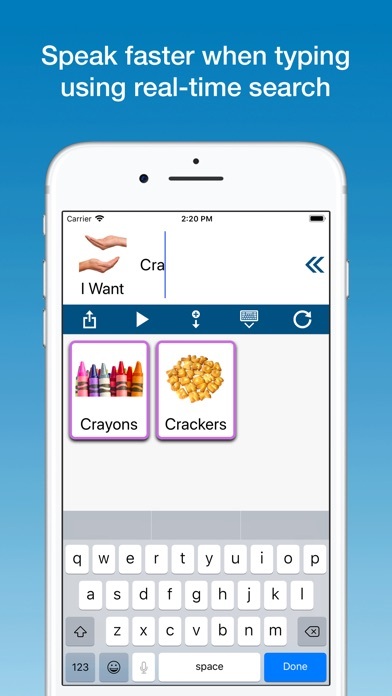 • Use the built-in iOS keyboard with the Speech Builder. • Speak words and/or letters as you type. • Share your Speech Builder message with other apps. • Personalize your voice, delay between words, & dialect. 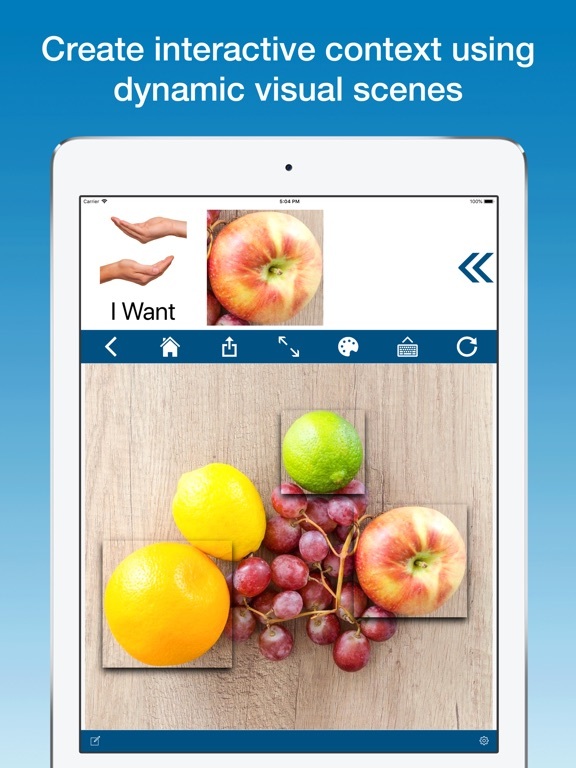 • Add images & video from your camera, photo library, or create a drawing. • Customize item styles (color, font, layout, alignment, border, shadow). • Create, save, & apply style templates. • Quickly create new cards with a single tap. • Toggle fullscreen mode to show or hide the Speech Builder. • Sort folders alphabetically, by date created, or via drag & drop. • Customize the grid for all or individual folders. • Easily move & copy items. • Choose a toolbar color theme. • Supports both portrait & landscape orientations. • Supports Multitasking on the iPad so you never have to leave your voice to view other apps. • Switch between multiple users, each with their own content & settings. • Enhance independent learning using prompted sequences. 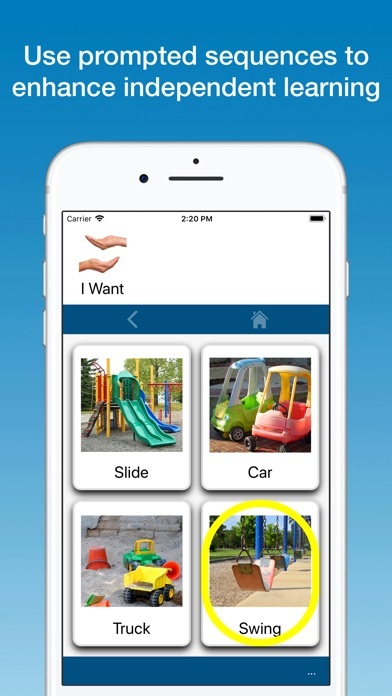 • Autoplay sequence items to create novel learning & interactions. • Review & export recent history to include typing and drawings. • Import & export items & users to share with others. • Import & export vocabulary as a CSV file. • Easily create picture sheets of items to print out. • Select which toolbar buttons to show or hide. • Search & filter items while in edit mode. • Lock scrolling to the grid size. • Show & hide individual items. • Enable sensitive touch to items. • Make individual items non-speakable. • Prevent tapping to other items while speaking a card. 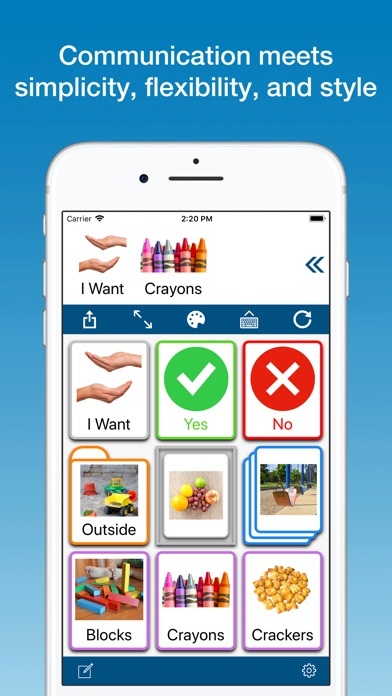 • Sort items randomly to enhance learning & acquisition. 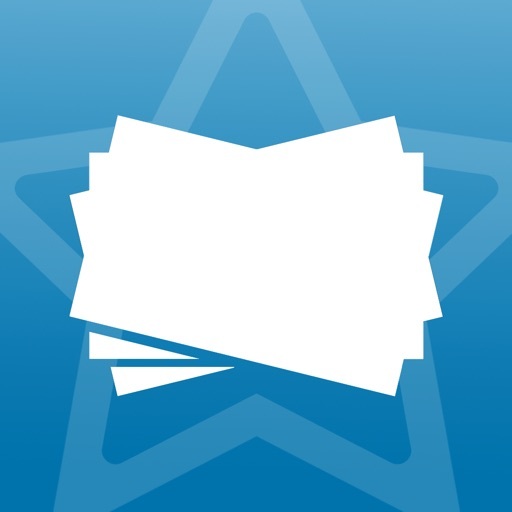 • Return home after tapping a card inside a folder or visual scene. 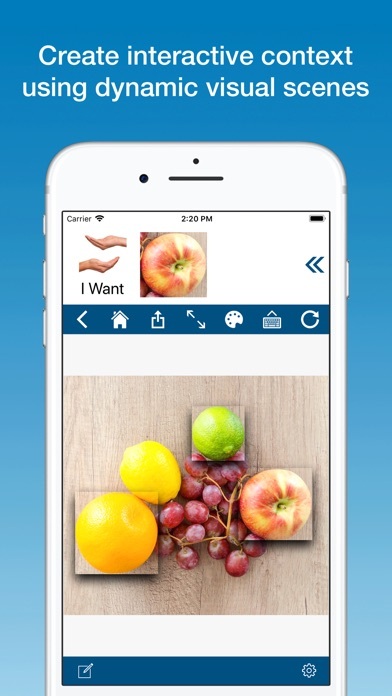 • Drag & drop images directly into a grid or visual scene to quickly create cards (via iPad Multitasking). 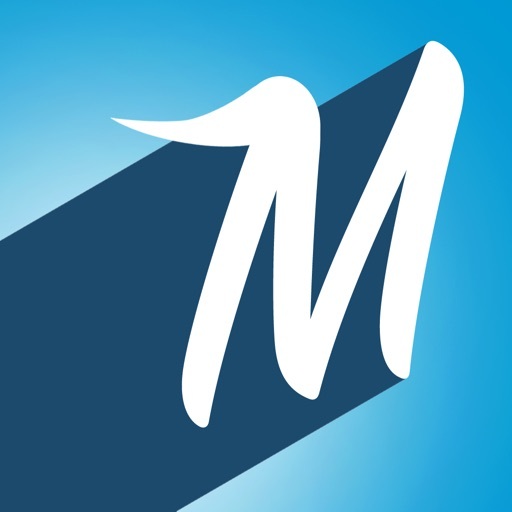 This app does not come with any preloaded images but supports easily adding photos from your camera, photo library, or by creating a drawing. 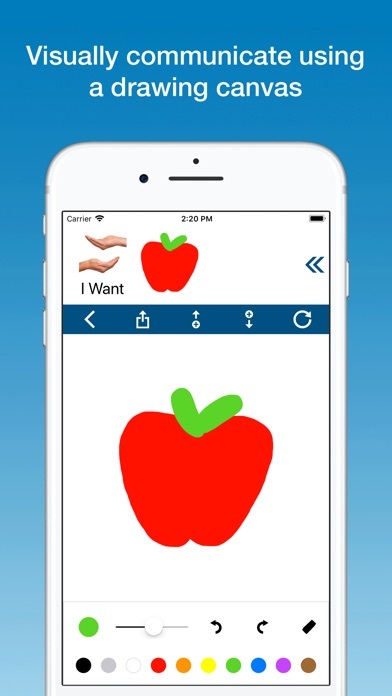 - Review & export recent history to include typing & drawings (3 day rolling period). - Setting to stop speaking when backspace or clear buttons are tapped. - Setting to always show play button when not typing or fullscreen. - Sort items by date created (newest to oldest).